After the major early-season, stream-born insect hatches have waned, there are few water-born insects that parr have to feed on. Terrestrial insects such as stouts (deer flies), moths, ants and butterflies become surface targets for these juvenile salmon to survive and grow. These surface-minded fish eventually go to sea and return as adults on their spawning run. When they settle in the river, they shake off their sea-feeding habits, go into a nature-induced fast and soon acclimatize to their stream environment. Although they are fasting, the predator-prey instinct doesn’t wane altogether and the skating wet fly effectively elicits the rise-reflex in these once surface-oriented salmon. This theory bears some validity as, on some of our rivers, more salmon are taken on hitched wet flies and on dry flies than on sub-surface wet flies. The hitch developed as a made-in-Newfoundland means of attaching a leader to a broken gut-eyed fly that unintentionally spawned a new angling method for Atlantic salmon. Its use began at Portland Creek, on Newfoundland’s northwest coast, prior to 1933. In a 1956 article for the Atlantic Salmon Journal, Fred Clarke, owner of The Anglers Mart in Corner Brook (now Barnes Sporting Goods) relates using it, after being shown by a local angler, while fishing the river in 1933. There were few flies available to the anglers on that coast in that era and those which were often had straight-shanked hooks with silkworm-gut eyes. These loops often became brittle with age and broke. The only way to use the broken-eyed fly was to initially tie the leader to the hook shank, at the bend, and carry the leader alongside the fly. The leader then was twisted to form a hitch loop that was positioned behind the head to secure the leader. A second loop hitch was place aft of and abutting the first, to finally secure the leader. Although the fly skimmed the water surface with head poking above, anglers caught as many, and often more salmon, using this new fishing method. The hitch didn’t spread outside of the area until Lee Wulff fished Portland Creek in the early ‘40s and wrote an article about its use for Outdoor Life Magazine. Eventually, the hitch spread throughout Newfoundland and Labrador, and indeed, to salmon and steelhead destinations worldwide. Its popularity is due not only to it being an exciting way, but it being an ultra-effective method of fishing. In fact, the hitched wet fly is often the only consistent method to move sullen fish on many waters. When fishing the Riffling Hitch, the fly must be secured to the leader and the hitches placed in the correct manner. If fishing from the left bank, while looking downriver, the hitched leader should come from below the fly head and extend out from the near-side of the fly, as the fly points upstream. The opposite is true if fishing from the right bank. If done incorrectly, especially while using a heavy or stiff leader, there is a chance the fly may swim upside-down. An offshoot of the hitch is what I call the “Discreet” Hitch. In this style, the leader hitches are formed between the front of the fly head and the rear of the Turle knot. When formed in this method, only the hook eye planes the water surface, making minimum surface disturbance. Just as the fish often prefer a smaller fly as the season lengthens, so too do they favour the Discreet Hitch. The first time I saw the Discreet Hitch used was in the late-80s when a friend of mine, Fergus Murphy, fished it at Seal Pool on Southwest River. There were few fish in the pool but a grilse was jumping repeatedly beside Wulff Rock. We both tried a couple of flies without success until Fergus knotted on a small Orange Riffle fly with a Discreet Hitch. One cast later, he was fast to the fish. Well, colour me stupid, but I used the Discreet Hitch only occasionally for years, until I started fishing and guiding on the Flowers River in Labrador. On the smooth, clear pools of the Flowers, the salmon favour the low-profile Discreet Hitch more often than not. The waters are often more shallow than many of the rivers I grew up on and, with the water so clear, the fish see the discreet-hitched fly as readily. The normally hitched fly, I think, is too aggressive for many of those fish and put them down. The hitch formed behind the head, in the original manner, is destructive to fly heads. 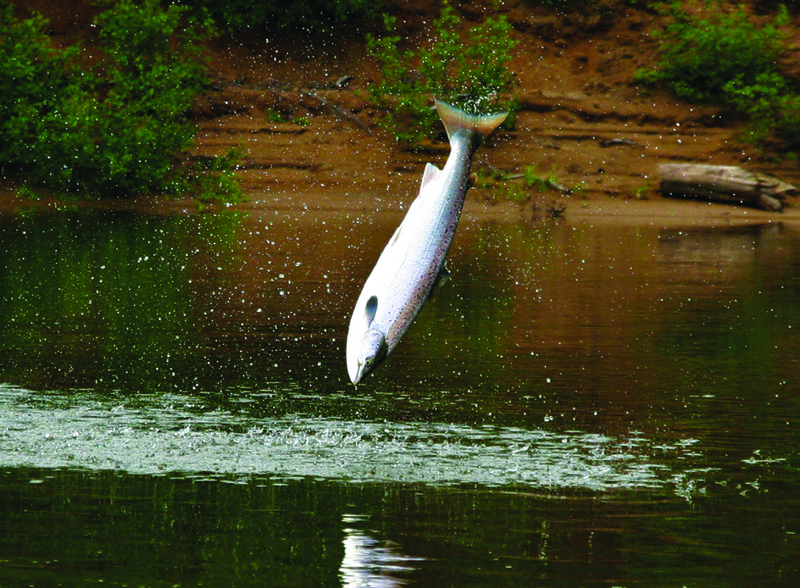 The act of playing a salmon puts tremendous pressure on the hitch loops and they bite into the material it secures. Even the act of removing the hitch loops often results in scraping off of head cement and thread. The fly often has to be retired or a new head formed to bring it back into service. I’ve even seen anglers resign from using the hitch altogether due to this type of damage. The Discreet Hitch would solve that problem and would give them another option to try on salmon, rather than just having the normally-fished wet fly in their arsenal. When tying my wet flies, I always plan for leaving a space between the front of the fly head and the base of the hook eye to facilitate the Turle knot and the leader loops forming the Discreet Hitch. It takes a tying sessions to work out the spacing and the fly’s proportions, but is well worth the effort. To correctly fish a hitched fly, the fly has to be swung on a tight line. If there is any slack on the presentation, it should be removed immediately by stripping in line. The proper way to do this is by loosely pinching the fly line under the middle finger of the rod hand and stripping the line in with the other hand, until the line is tight. If one does not take this initial step, the fly may only riffle at the very end of the swing, or more likely, not at all. There are some very important factors to consider when fishing the hitch and their influences in fishing it correctly. They include the water speed and the smoothness of flow, the rod angle while the fly is fished, the fly mass and the materials in its make-up, and the leader size. All have an important bearing on the resultant way the fly is presented. The usual manner to fish the hitched wet fly is to cast the fly out at the customary 45-60-degree angle toward the far river bank and let the fly swing across the current toward the near bank. In medium-to-fast flowing water, there is little adjustment to be made, other than tightening the line at the start of the swing. The rod tip can be kept low so one is in the optimum position to strike if the fish is felt on the rise. If the water pace is slow, the fly is on the large side or there are eddies created by current breaks, other strategies should be employed. In slower water or while fishing larger fly specimens, line retrieval may be warranted. This is because the water flow is not heavy enough to support the fly. The most effective manipulation of the fly is to use a smooth-thrust fly retrieve, after the fly is cast. To perform it, the line hand reaches up behind the rod hand, grasping the line and smoothly pulling it back to the hip. At the same time, the rod hand is thrust forward and extended outward in front of you. The line is now pinched by the middle finger of your rod hand. Then, as you smoothly pull the rod back towards your body, reach forward with your line hand and meet your rod hand at the initial starting point. The process is repeated, as many times as required, to obtain a smooth swing across the flow. This is a much better method of fly retrieval than just stripping with the line hand, as it negates the “herky-jerky fly” movements that often put fish down. The lengths of line that was stripped in can be released and dropped in the water beside you. A better method is to pinch the line with the line hand and form loops. By forming loops of line, held-in-hand, you negate the water drag that occurs from laying the line on the water. This results in less tangled running lines and you get a better shoot on the next fly cast. In conjunction with this smooth retrieve, the rod angle may have to be adjusted to aid in riffling the fly in slower water. A higher rod tip will sometimes help carry the fly atop the water more easily than the required rod angle in the first scenario outlined above. This is due to less line drag in the water and a more direct contact with the fly while it is being manipulated across the river. When performed correctly, almost any sized fly can be riffled. The pools and runs that have current breaks and eddies are the tougher ones to riffle a fly properly. As the fly swims across a fast flow and meets an eddy, slack is thrown into the leader and the fly line with the fly being swept under the surface. In this case, using a higher rod angle, in combination with a line and rod hand retrieve, are necessary. The proper practice here is to lift the fly rod at a more acute angle and to strip at a more hurried pace when the fly hits an eddy and return to a more normal tempo when it returns to the downstream flow. How fast one has to strip varies from case to case and you will have to experiment to find the proper speed. Never, in any scenario, should the fly throw spray, as this will definitely put fish down. The fly’s bulk, the material in its dressing and, of course, its size has an important influence to keep it at the surface. In good water, with an optimum flow, it is not difficult to fish almost any fly size easily. Just the same, a bulky-bodied pattern, with stiff moose hair for a wing and dressed on a light-wire hook, could be counted on to ride atop the water more readily than a slimly-dressed fly with a soft squirrel haired wing fished on a heavy salmon iron. The fly in the former instance offers more water resistance than the latter and is a simple explanation that should be rational for all to envision. The leader that is attached to the fly has an important influence on the fly’s ability to ride the water. A stiff or heavy leader will support a fly more easily than a fine leader. It is simple physics which support this premise. Personally, I like to fish as long and fine a leader that I can for the existing conditions. Most often it will be a clear or light green leader material rather than brown favoured by most anglers in Newfoundland and Labrador. Only in the roughest water, or in truly dark water, will I switch to lines such as Maxima Chameleon. The less the fish sees of my tackle, besides the fly, the better, is my motto. The real key to Atlantic salmon success is finding the right combination of fly size that exhibits the correct silhouette and colour, coupled with an appropriately-sized leader and fished at an enticing fly speed. This pertains to fishing not only the hitched fly, but normally-fished wet flies as well. Let the conditions and the salmon be your guide.